Objective: Lumbosacral transition vertebrae (LSTVs) are associated with alterations in biomechanics and anatomy of spinal and paraspinal structures, which have important implications on surgical approaches and techniques. LSTVs are often inaccurately detected and classified on standard anteroposterior radiographs and magnetic resonance imaging. The use of whole-spine images as well as geometric relationships between the sacrum and lumbar vertebra increases accuracy. The diagnosis of symptomatic LSTV is considered with appropriate patient history and imaging studies. This study aimed to classify the anatomical variations in LSTV and determine, by plain radiography, if there exists a relationship between sacralization and low backache (LBP). Materials and Methods: Five hundred lumbosacral radiographs of LBP patients were examined after obtaining prior consent from the patient and approval from the “institutional ethics committee.” Data collection consisted of the patient's age at the time of imaging gender and number of lumbar vertebral bodies. Dysplastic transverse processes were classified according to the Castellvi radiographic classification system. The incidence of sacralization in patients and the control groups was reported, and the anomaly was compared according to the groups. Results: Of these patient groups, 134 were classified as positive for sacralization, which resulted in an incidence of 26.8%. The most common anatomical variant was Castellvi Type IA (7.6%). There were no statistically significant differences between men and women who had anomaly (P = 0.9256). Higher incidences of Type IB and Type IIB were found in men, but those results were not statistically significant (P = 0.133 and P = 0.581, respectively) when compared with the female group. Daily frequency and intensity of LBP were assessed in patients using visual analog scale (VAS) scores. The patients with LBP and no malformation reported an average pain level on the VAS for pain of 2.2 versus 5.2 in patients with LBP and a transitional vertebra, respectively. Conclusion: Based on our data, we conclude that lumbosacral transitional segments are a common cause in the low-backache population. However, no relationship was found between age and genders in this study. However, in comparison with the nonspecific low-backache group, the VAS scores were significantly higher and the pain duration was significantly longer in the LSTV group. Lumbosacral transitional vertebrae (LSTVs) are congenital spinal anomalies, in which an elongated transverse process of the last lumbar vertebra fuses with varying degree to the “first” sacral segment . LSTV, as a morphological variation, spans a spectrum from partial/complete L5 sacralization to partial/complete S1 lumbarization . When the L5 vertebra fuses completely to the sacrum, 4 lumbar vertebrae exist, whereas when S1 separates entirely from the sacrum, 6 lumbar vertebrae exist and the sagittal contour of the spine becomes more lordotic . Many intermediate incomplete transitions have also been recognized and classified as LSTV. Usually, the transitional vertebra will have a “spatulated” transverse process on one side resulting in articulation or partial articulation with the sacrum or at time the ilium and in some cases with both. This results in limited/altered motion at the lumbosacral articulation. This loss of motion will then be compensated for at segments superior to the transitional vertebra resulting in accelerated degeneration and strain through the L4 disc level which can become symptomatic and inflame the adjacent L5 nerve root resulting in “sciatic” or radicular pain patterns . Scoliosis is frequently associated with Bertolotti's syndrome. In light of the economic and social impact of low back pain (LBP) in young people, it is important to illustrate Bertolotti's syndrome in the list of differential diagnosis when investigating young people with LBP . Although it has been long contested, there is fairly convincing evidence of an association of LBP with LSTV. In this study, we focused on the incidence of this pathology and the relationship between the ages and genders. In this prospective study, 500 lumbosacral radiographs of LBP orthopedic outpatients were collected over a 2-year period. The ages ranged between 16 years and 73 years, and both sexes were involved. All the patients gave the informed consent before included into the study, and the approval of the “institutional ethics committee” has been obtained (No: IEC/1/552/2017). Frontal (anteroposterior [AP]) and lateral lumbosacral regions were evaluated. The radiographs were examined, and data were collected and analyzed. We included only LBP patients. These patients were treated as outpatients who did not require hospitalization for previous LBP episodes. Exclusion criteria consisted of the radiculopathies, degenerated levels, and any radiologic evidence of previous lumbosacral surgery that would obstruct our measurements. Severity of back pain was not significant for this study. Our aim was to describe any relationship about LSTV in the localized LBP outpatients. Because of that, severity of pain has not been queried. A total of 500 lumbosacral films were examined and identified as being adequate for measurement of the desired parameters. Data collection using digital radiographs consisted of the patient's age at the time of imaging, gender, and the number of lumbar vertebral bodies. Patients without transverse process dysplasia were classified as normal (Type 0), and those with dysplastic transverse process were classified according to the Castellvi radiographic classification system [Table 1]. The incidence of LSTV in patients with LBP was reported, and the patients who had LSTV were compared according to gender and age. Statistically significant differences were evaluated using contingency tables with Fisher's exact test for categorical variables. This test was used to compare statistically the differences between men and women with LSTV. In addition, it was used to compare patients older than 35 years with younger patients. Statistical significance was set at P < 0.05. Five hundred patients, 294 women and 206 men, were identified as eligible for the study; the average age was 39.03 ± 15.9 years (16–73 years). Of these patients, 134 were classified as positive for transitional lumbosacral vertebra, with a gender distribution of 70 (23.6%) women and 59 (28.4%) men. These numbers resulted in an incidence of 26.8%, and a ratio of 1:2.7 (approximately one case of LSTV to every three normal patients with normal spines presented with LBP) [Table 2]. Of the total number of males (206) seen, 59 (28.6%) had LSTV and 147 (71.4%) had normal spines. This shows that the ratio of incidence of LSTV males to normal males is 1:2.49. Of the 294 females seen, 70 (23.6%) had LSTV and 224 (78.3%) had normal spines, for a ratio of incidence of LSTV females to normal females of 1:3.2. Of the total number of patients (500) seen, 16 (3.2%) had lumbarization; sacralization (118 patients, 23.6%) is the more common LSTV [Table 2]. The incidence ratio of sacralization to lumbarization is approximately 7.4:1. According to sacralization classification, the most common anatomical variant was Castellvi Type IA (7.6%), followed by Type IB (6.0%), Type IIA (1.8%), Type IIB (2.0%), Type IIIA (1.6%), Type IIIB (3.8%), and Type IV (0.8%) [Table 1]. There were 270 (54%) patients older than 35 years old and 230 (46%) younger patients. 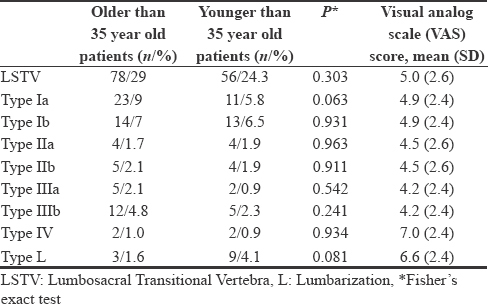 Seventy-eight of the older patients had LSTV, compared with 56 of the younger patients. No statistically significant difference was found between these two age groups according to the incidence of LSTV (P = 0.9256) [Table 3]. There were no statistically significant differences between men and women who had LSTV (P = 0.301) [Table 4]. Higher incidences of Type IB and Type IIB were found in men, but those results were not statistically significant (P = 0.133, P = 0.581) when compared with the female group [Table 4]. Daily frequency and intensity of LBP were assessed in patients using visual analog scale (VAS) scores. Both the intensity and frequency of pain were represented by a straight line of 10 cm; 0 represented no pain and 10 represented the worst and most frequent pain imaginable. 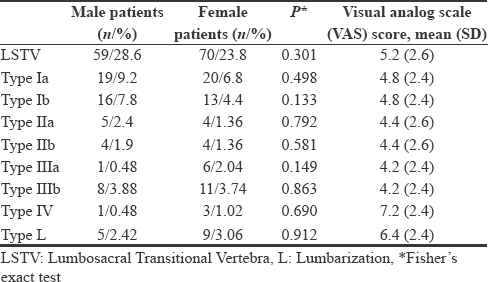 Comparison of LSTV according to the age groups [Table 3] and gender [Table 4] and their correlation to VAS scores were statistically analyzed. In comparison with the nonspecific low-backache group, the VAS scores were significantly higher, and the pain duration was significantly longer in the LSTV group (P < 0.05) [Table 5]. The patients with LBP and no malformation reported an average pain level on the VAS for pain of 2.2 versus 5.2 in patients with LBP and a transitional vertebra. Castellvi et al. classified LSTV into four types [Figure 1]. Type I includes unilateral (Ia) or bilateral (Ib) dysplastic transverse processes, measuring at least 19 mm in width (craniocaudal dimension). Type II exhibits incomplete unilateral (IIa) or bilateral (IIb) lumbarization/sacralization with an enlarged transverse process that has a diarthrodial joint between itself and the sacrum. Type III LSTV describes unilateral (IIIa) or bilateral (IIIb) lumbarization/sacralization with complete osseous fusion of the transverse processes to the sacrum. Type IV involves a unilateral type II transition with a type III on the contralateral side . The incidence of our lumbar spine patients who had a transitional vertebra was 26.8%. Our study found an incidence rate for lumbosacral transitional state in the LBP population and defined the occurrence rate for each subtype of the Castellvi radiographic classification system. In comparison, Castellvi et al. reported a 30% prevalence on their LBP population, stating higher rates for Types IV, IIIB, and both Types II. Their biggest cohort came from the Type II (38.3%), whereas ours was largely from Type I (IA and IB) (51.7%). Apazidis et al. found 35.6% prevalence of LSTV in their studies of 211 lumbar spine patients who had no pain. Their most commonly found pathology was Type IA (14.7%), as in our study. There were no statistically significant differences between men and women who had LSTV in our study. Mostly in the literature, LSTV is predominant in males. We described that 270 of the older patients had LSTV, compared with 230 of the younger patients. No statistically significant difference was found between these two age groups according to the incidence of LSTV. In a series of 4000 patients, Tini et al. reported no correlation between LBP and transitional vertebrae . Elster found that the incidence of structural pathology (disk pathology and spinal and foraminal stenosis) did not differ in patients with LSTV compared with those without transitional vertebrae . Luoma et al. reported an increased risk of early degeneration in the upper disk in young patients, but this change was obscured by age-related changes in the middle-aged population . Epstein et al. described increased disk herniation in adolescents with spinal anomalies, including LSTV . Elster likened the hypermobility at the disk level above the LSTV to adjacent-level disease seen at spinal segments above and below postsurgical fusion masses or a block vertebra . Hypermobility and abnormal torque moments at the intervertebral disk are believed to place the disk and facet joints at increased risk of accelerated degeneration. Luoma et al. found that the iliolumbar ligaments above an LSTV were thinner and weaker, potentially further predisposing this level to hypermobility and premature degeneration . No difference has been reported in the incidence of spondylolysis or spondylolisthesis between patients with LSTVs and controls. Epstein et al., in a series of 48 patients with LBP and an LSTV, showed increased uptake at the anomalous articulation between the transverse process of the LSTV and the sacrum in 81% of patients . In a study of 211 participants, Apazidis et al. determined Type IA most common with a prevalence of 14.7% ; however, Type I is generally considered to have no clinical significance and does not require further attention in clinical practice . In an asymptomatic population, Nardo et al. determined that Type I and Type II were each responsible for more than 40% of total occurrences of LSTV, while Type III and Type IV accounted for 11.5% and 5.25% of occurrences, respectively . In unilaterally occurring malformations, the incidence is significantly higher on the left side, a finding which remains unexplained. LSTVs affect the terminal level of the conus medullaris (TLCM). Compared to controls, the TLCM is significantly higher in the presence of a sacralized L5 and significantly lower in the presence of a lumbardized S1. This finding may help clinicians identify the neurological discrepancies observed among neurologic injuries at the thoracolumbar junction . LSTVs exhibit altered articular facets at the L5–S1 junction such that the facets are smaller and more coronally oriented. Lumbarization results in the smallest facet linear dimension, smallest surface area, and maximal coronal orientation. Sacralization demonstrates an insignificant alteration in facet morphology. Facet asymmetry is predominantly associated with accessory L5–S1 articulations, but is seen in all LSTV subtypes. These alterations are possibly related to LBP situations . In an anatomical study of 70 cadavers, Aihara et al. found that the iliolumbar ligaments at the level immediately above transitional vertebrae are thinner and weaker than those in cadavers without LSTV . In our study, we found no relationship between age and genders in patients with Bertolotti's syndrome. However, in comparison with the nonspecific low backache group, the VAS scores were significantly higher and the pain duration was significantly longer in the LSTV group (P < 0.05). Highest mean VAS scores of 7.1 were noted in Type IV LSTV as compared to mean scores of 4.2 in Type III LSTV. Lowest mean values of 2.2 were recorded for non-LSTV group. LSTVs have been classically identified using lateral and Ferguson radiographs [Figure 2]. In 1984, Castellvi et al. described a radiographic classification system identifying four types of LSTVs on the basis of morphologic characteristics [Figure 1]. Type I includes unilateral (Ia) or bilateral (Ib) dysplastic transverse processes, measuring at least 19 mm in width (craniocaudal dimension). Type II exhibits incomplete unilateral (IIa) or bilateral (IIb) lumbarization/sacralization with an enlarged transverse process that has a diarthrodial joint between itself and the sacrum. Type III LSTV describes unilateral (IIIa) or bilateral (IIIb) lumbarization/sacralization with complete osseous fusion of the transverse processes to the sacrum. Type IV involves a unilateral type II transition with a type III on the contralateral side. Wigh and Anthony describe the “squared” appearance of transitional vertebrae on lateral radiographs as the ratio of the AP diameter of the superior vertebral endplate to that of the inferior vertebral endplate as ≤1.37 . These relative “squaring” and “wedging” represent a spectrum of vertebral body morphologic change and cannot be reliably used to definitively identify an LSTV. Nicholson et al. described a decreased height on radiographs of the disk between a lumbar transitional segment and the sacrum compared with the normal disk height between L5 and S1 . Not only is identification of an LSTV important, accurate numeric identification of the vertebral segments on magnetic resonance imaging (MRI) is essential before surgery. Inaccurate numbering may lead to an interventional procedure or surgery at an unintended level. Establishing whether an LSTV is a lumbarized S1 or a sacralized L5 on MRI alone can often be problematic . LBP in the presence of an LSTV was originally noted by Mario Bertolotti in 1917 and termed “Bertolotti's Syndrome.” According to Quinlan et al., the prevalence of Bertolotti's syndrome is 4.6% in the general population and 11.4% in patients under the age of 30 years . Among 8280 patients seeking care for LBP, Paik et al. found that 10.6% had LSTV types II, III, or IV, with sacralization accounting for 5.3% and lumbarization accounting for 5.3% . Throughout the literature, the prevalence of LSTV in patients seeking care for LBP ranges from 4.6% to 35.6% . Due to its wide prevalence, Quinlan et al. encourage physicians to consider Bertolotti's syndrome in the differential diagnosis for LBP, especially in younger patients . Symptoms can originate from the anomalous articulation itself, the contralateral facet joint (when unilateral), instability and early degeneration of the level cephalad to the transitional vertebrae, and nerve root compression from hypertrophy of the transverse process . The symptoms associated with each of the above processes are treated differently, requiring reliable techniques to not only identify LSTVs but also determine the type and site of the pathology generated by the transitional segment. While LSTVs can be identified on all imaging modalities, they have been classically described as being best imaged on Ferguson radiographs (AP radiographs angled cranially at 30°). Currently, given its superior spatial resolution, CT is the best imaging technique for characterization of LSTVs . Bertolotti's syndrome, the association between an LSTV and LBP is controversial and has been both supported and disputed since Bertolotti first described it in 1917 . Although not initially described, the LBP of this syndrome is currently thought to be of varying etiologies, subsequently arising from different locations: (1) disk, spinal canal, and posterior element pathology at the level above a transition ; (2) degeneration of the anomalous articulation between an LSTV and the sacrum; (3) facet joint arthrosis contralateral to a unilateral fused or articulating LSTV ; and (4) extraforaminal stenosis secondary to the presence of a broadened transverse process. The accurate assessment of spinal segmentation is crucial in eliminating surgical and procedural errors because most wrong-level spine surgery occurs in patients with variant spine anatomy, including LSTVs . Often, surgical errors occur when MRI of the lumbar spine is reported without accompanying conventional radiographs or cervicothoracic MR localizers . Because intraoperative radiographs are used during spinal surgery for confirmation of disk level, it is important to correlate prior MRI with these radiographs. Although there is no consensus on the clinical significance of LSTVs, several treatment strategies have been advocated. These include conservative nonsurgical management with local injection of anesthetic and corticosteroids within the pseudoarticulation or contralateral facet joint, radiofrequency ablation and surgical management with partial transverse process resection, and/or posterior spinal fusion. It is suggested that local anesthetic injection be part of the diagnostic workup in patients with Bertolotti's syndrome for whom surgery is being considered . Direct local anesthetic and steroid injection or surgical resection of the anomalous or contralateral facet joint has produced successful relief of pain and can yield valuable diagnostic information. Operative treatment is suggested in selected patients. For example, resection of the transverse process may be beneficial for those who demonstrate pain truly emanating from a transitional joint and fail conservative treatment. LSTVs are common anomalies of the spine necessitating the ability to accurately identify and number the affected segment. Knowledge of the biomechanical alterations within the spine caused by LSTVs will aid the radiologist in understanding and recognizing the imaging findings seen in patients with LBP with a transitional segment. Accurate enumeration of LSTV and communication to the referring clinician will help avoid such dreaded complications as wrong-level spine surgery. This study focuses on the evaluation of radiographic morphology of sacrum bearing accessory articulations with the L5 vertebrae in the LBP population. Based on our data, we conclude that lumbosacral transitional segments are common in the LBP population. We found that no relationship was found between age and genders. However, in comparison with the nonspecific low backache group, the VAS scores were significantly higher and the pain duration was significantly longer in the LSTV group. Hughes RJ, Saifuddin A. Imaging of lumbosacral transitional vertebrae. Clin Radiol 2004;59:984-91. Mahato NK. Redefining lumbosacral transitional vertebrae (LSTV) classification: Integrating the full spectrum of morphological alterations in a biomechanical continuum. Med Hypotheses 2013;81:76-81. Mahato NK. Complexity of neutral zones, lumbar stability and subsystem adaptations: Probable alterations in lumbosacral transitional vertebrae (LSTV) subtypes. Med Hypotheses 2013;80:61-4. Jain A, Agarwal A, Jain S, Shamshery C. Bertolotti syndrome: A diagnostic and management dilemma for pain physicians. Korean J Pain 2013;26:368-73. Manmohan S, Dzulkarnain A, Nor Azlin ZA, Fazir M. Bertolotti's syndrome: A commonly missed cause of back pain in young patients. Malays Fam Physician 2015;10:55-8. Castellvi AE, Goldstein LA, Chan DP. Lumbosacral transitional vertebrae and their relationship with lumbar extradural defects. Spine (Phila Pa 1976) 1984;9:493-5. Apazidis A, Ricart PA, Diefenbach CM, Spivak JM. The prevalence of transitional vertebrae in the lumbar spine. Spine J 2011;11:858-62. Tini PG, Wieser C, Zinn WM. The transitional vertebra of the lumbosacral spine: Its radiological classification, incidence, prevalence, and clinical significance. Rheumatol Rehabil 1977;16:180-5. Elster AD. Bertolotti's syndrome revisited. Transitional vertebrae of the lumbar spine. Spine (Phila Pa 1976) 1989;14:1373-7. Luoma K, Vehmas T, Raininko R, Luukkonen R, Riihimäki H. Lumbosacral transitional vertebra: Relation to disc degeneration and low back pain. Spine (Phila Pa 1976) 2004;29:200-5. Epstein JA, Epstein NE, Marc J, Rosenthal AD, Lavine LS. Lumbar intervertebral disk herniation in teenage children: Recognition and management of associated anomalies. Spine (Phila Pa 1976) 1984;9:427-32. Nardo L, Alizai H, Virayavanich W, Liu F, Hernandez A, Lynch JA, et al. Lumbosacral transitional vertebrae: Association with low back pain. Radiology 2012;265:497-503. Morimoto T, Sonohata M, Kitajima M, Konishi H, Otani K, Kikuchi S, et al. The termination level of the conus medullaris and lumbosacral transitional vertebrae. J Orthop Sci 2013;18:878-84. Mahato NK. Facet dimensions, orientation, and symmetry at L5-S1 junction in lumbosacral transitional states. Spine (Phila Pa 1976) 2011;36:E569-73. Aihara T, Takahashi K, Ogasawara A, Itadera E, Ono Y, Moriya H, et al. Intervertebral disc degeneration associated with lumbosacral transitional vertebrae: A clinical and anatomical study. J Bone Joint Surg Br 2005;87:687-91. Wigh RE, Anthony HF Jr. Transitional lumbosacral discs. Probability of herniation. Spine (Phila Pa 1976) 1981;6:168-71. Nicholson AA, Roberts GM, Williams LA. The measured height of the lumbosacral disc in patients with and without transitional vertebrae. Br J Radiol 1988;61:454-5. Hahn PY, Strobel JJ, Hahn FJ. Verification of lumbosacral segments on MR images: Identification of transitional vertebrae. Radiology 1992;182:580-1. Quinlan JF, Duke D, Eustace S. Bertolotti's syndrome. A cause of back pain in young people. J Bone Joint Surg Br 2006;88:1183-6. Paik NC, Lim CS, Jang HS. Numeric and morphological verification of lumbosacral segments in 8280 consecutive patients. Spine (Phila Pa 1976) 2013;38:E573-8. Brault JS, Smith J, Currier BL. Partial lumbosacral transitional vertebra resection for contralateral facetogenic pain. Spine (Phila Pa 1976) 2001;26:226-9. Seçer M, Muradov JM, Dalgiç A. Evaluation of congenital lumbosacral malformations and neurological findings in patients with low back pain. Turk Neurosurg 2009;19:145-8. Chang HS, Nakagawa H. Altered function of lumbar nerve roots in patients with transitional lumbosacral vertebrae. Spine (Phila Pa 1976) 2004;29:1632-5. Delport EG, Cucuzzella TR, Kim N, Marley J, Pruitt C, Delport AG, et al. Lumbosacral transitional vertebrae: Incidence in a consecutive patient series. Pain Physician 2006;9:53-6. Connolly LP, d'Hemecourt PA, Connolly SA, Drubach LA, Micheli LJ, Treves ST, et al. Skeletal scintigraphy of young patients with low-back pain and a lumbosacral transitional vertebra. J Nucl Med 2003;44:909-14. Wigh RE. The thoracolumbar and lumbosacral transitional junctions. Spine (Phila Pa 1976) 1980;5:215-22. O'Driscoll CM, Irwin A, Saifuddin A. Variations in morphology of the lumbosacral junction on sagittal MRI: Correlation with plain radiography. Skeletal Radiol 1996;25:225-30. Santavirta S, Tallroth K, Ylinen P, Suoranta H. Surgical treatment of bertolotti's syndrome. Follow-up of 16 patients. Arch Orthop Trauma Surg 1993;112:82-7.